No doubt most people who read this blog will also read Jac's blog. 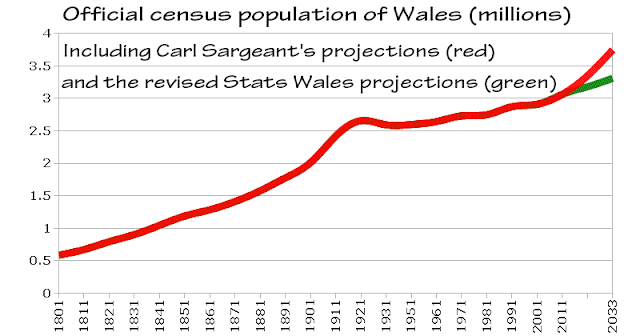 And recently Jac has posted about the wildly varying projected population figures for Wales for the next couple of decades. So I am going to use the data from these projections and compare it with the historical population figures. And see what happens. My first port of call was the ONS website, in particular this report (.pdf) which also has a link to a table with the official census figures for Wales from 1801 to 2011. I was just going to do it from 1911 but since someone has kindly gone to all that trouble to table them nicely I will go back to 1801. I've literally lifted that graph straight from the report, I did replace the text and of course alter the hue to make it a patriotic red instead of blue but apart from that. It's the ONS graph. What we really need for this is a line graph not a bar graph. So I will use the ONS chart data to make my own line graph. 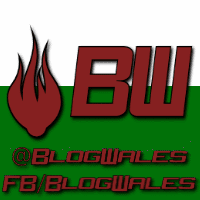 I will then add both the figures that Jac has used which are the old Stats Wales figures Carl Seargant is still quoting and the more recent figures from Stats Wales. Again, just to see what happens. Here we have the finished graph. Up until 2011 the population figure uses the official census stats, note that there was no census in 1941 due to WW2. After 2011 is where the magic happens, the red line continues up to where Carl Sargeant claims the population will end up. The green line continues to where the revised Stats Wales projections tell us the population will end up. The steepness of the graph from now until Carl Sargeant's 2033 has only ever happened once in the past 200 years, that was between 1901 and 1921 although even then it was tailing off at 1921 and starting to drop and the population didn't reach 1921's figure again until the mid 1960's. (If anyone has an explanation as to why our population dropped so much in the 1920s then please add a comment). The green line, which is the revised Stats Wales projected population increase until the year 2037 appears to follow the rate of growth from around the 1930s on. Here we have the same graph again except this time I have drawn a line from the 1801 figure to the 2037 (green) figure. Apart from the population 'explosion' of the early 1900s the line projected growth does appear to match the rate of growth for our population over the last 200 years. That being said it is still clearly steeper than the growth in our population from the 1930s onwards. So if you were to draw a line from the 1930s to the 2030s it would look a little something like this. Even the revised projection is starting to look a little too steep here. The black line illustrates the projected population based on the rate of growth since the 1930s. It's looking like it'll be around 3.2 million. An increase of around 150,000 people or so from the 2011 census. Or based on the 2.02 persons per household claimed by Stats Wales that means we need around 74,250 more homes in Wales. The revised Stats Wales figure suggests it'll be 247,000 more people in 122,000 more homes. Carl Sargeant says it'll be 685,000 more people in 339,000 new homes. My conclusions from these graphs are as follows, please share your own conclusions if they differ. 1. Cal Sargeant believes that by 2033 Wales will have experienced a population increase of such magnitude that it had only happened once in the last 232 years. 2. 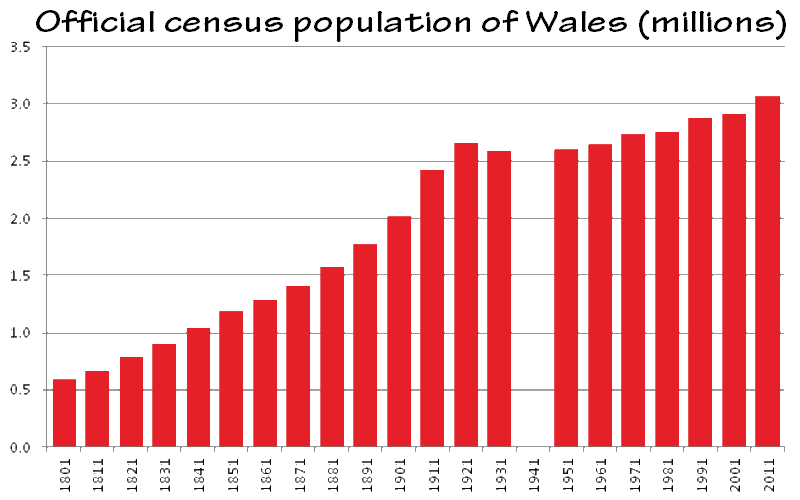 Stats Wales now believes that by 2037 Wales' population will continue to rise at a rate more similar to the rate at which is has grown over the previous 236 years. Given that Wales has failing hospitals, failing schools, a failing economy, a transport system that only makes sense as part of a colonial 'all roads lead to Rome' mindset and a natural resources policy of allowing our neighbour to steal everything we have then how does any of this factor in to the Welsh Governments core belief of 'sustainable development'. "Sustainability lies at the heart of the Welsh Government’s agenda for Wales; it also lies at the heart of this legislative programme. Taken as a whole, it will promote the economic, social and environmental wellbeing and enhance people’s quality of life in Wales It is about defining the long term development path for our nation. It means healthy, productive people; vibrant, inclusive communities; a diverse and resilient environment and an advanced and innovative economy. This legislative programme provides new powers, duties and institutional capacity to advance our goals of building a sustainable Wales." 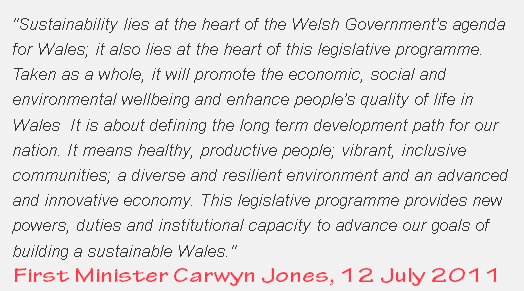 (First Minister Carwyn Jones, 12 July 2011). In view of the failings I have listed above and the statement by First Minister Carwyn Jones I have the following two conclusions. Again, please share your own conclusions if they differ. 1. The Labour led Welsh Government is either completely incompetent and / or deliberately destroying Wales for the sole benefit of our colonial masters. 2. Carwyn and all his chums are just puppets being controlled for the sole benefit of our colonial masters. When is an English paedo not an English paedo?